When I first discovered Amazon allowed authors to upload their ebooks for distribution on their site, I did a little happy dance. On the ceiling. A few months later I'm older and wiser as I've discovered that writing, formatting and uploading an indie ebook is only the beginning. With three quarters of a million books available for download on Amazon alone, why should readers pick your outpourings? "Because it's well written and the characters are fleshed out and loveable and the dialogue zings and the plot has amazing twists and turns and the story line is original and ... " Yeah yeah yeah. Your's and thousands of others babe. Your book sparkles and shines; entertains and enlightens, but until it begins to sell, it isn't going to get reviews or ratings and without reviews or ratings it ain't gonna sell. A classic catch 22 situation. By competition, I mean the successful indie writers. You wanna be up there with the big boys don't you? Go to Amazon's indie ebooks bestsellers. Study carefully. I'm not suggesting you follow blindly, after all you can't afford to lose your biggest selling point, your individual voice. But take a good hard look at their 'product description' as Amazon terms it. Also on this page, you'll see a link inviting you to learn more about the author. Click it. What information does the author share? How does it compare with your page - are you giving your potential audience the best chance of discovering more about you and your passion: Your writing. John Locke is famously the most successful indie author. Now he's published a book about it. And guess what? That's a best seller too! But he shares nicely. Search Amazon and Smashwords for ebooks on marketing your book. Read the reviews before you purchase, although some are free and there are many blogs such as this giving advice based on experience so Google now! You'll notice straight away the heavy heavy use of social media such as Twitter, Facebook et al. If you're under forty, you're gonna know more about this than I do. I yearn for a book trailer on YouTube but it seems beyond me, so I'm not even gonna try to pretend. One observation, Twitter seems more informal. Your Facebook page, at least the one promoting your work, should be professional. By this I mean don' t use it to relate your night out on the town with the girls. On Twitter, you'll find a lot of indie authors tweeting their blogs. Which brings me onto my next point. I know. This comes under social media. But it is so important it deserves it's own heading. If you have a moment, take a wander around this site. Can you tell what it's about yet? I'm hoping to tempt readers into trying a sample of my book. Because like your book, its entertaining, great storyline etc etc etc. But until potential readers sample, they'll never know what they're missing. And that would be a shame for both reader and author. I want to make it easy for people to preview my book. I've read countless blogs on websites much sleeker than this. I've enjoyed the style of writing. Interest caught, I've wanted to download a sample. But searched in vain for a link to sample or buy. Twice in desperation I emailed the website owner, pointing out there was no direct link to where their ebook could be purchased. Both times apologetic responses came back with links, however I noticed on revisiting the sites this communication failure hadn't been fixed. Use Twitter to make new tweetmates who share your interests and preferences. Invite them back to your place to read your blog; its the best feeling in the world when your blog readers take the time to comment. I always make certain I respond to each and every person who has cared enough to add their thoughts. Because Twitter only allows 140 characters many tweeters use links inviting further reading. If you find these links interesting say so. If you have a comment to add to a blog do so. Most now have built in aps enabling you to leave your own website address. It's like a trail of breadcrumbs leading back to the place you want your readers. Staring at your book synopsis, with their finger hovering over the 'sample' or better still 'buy now' link. Study your peer group to discover what works for them. Build up a following on social media sites. Get a website and blog. Fill it with good content and ensure that links to sample or purchase your ebooks are never more than a click away. This is just the beginning! I might be new at this, but this much I've learned - The hard work just started. As you begin to move within your social circles, you'll build relationships, and I've made some rock solid friends. Keeping up any friendship entails effort. But it'll be worth it. When you begin to receive unsolicited feedback from your readers saying how much they've enjoyed your book it is the best feeling in the world. As I've pointed out many times, I'm new here too! If you want to pick me up on anything or better yet, if you've got your own redhot never fail method of increasing awareness of your book's presence, please get in touch and leave a comment. I'd love to hear your recommendations, or just hear from you. Julia Hughes, author of A Ripple in time. Click here to join Blog. Click here to contact Julia. 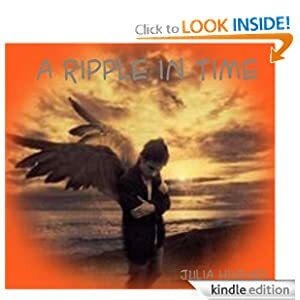 Click here to sample A Ripple in Time. Join me on Facebook.